Ginger tea is often recommended for adults to treat nausea, indigestion or stomach upset, but it is rarely used for infants and young children. Mild herbal teas are a way to treat minor discomfort and illness in children, according to Dr. Lisa Watson, ND, and are very safe when used as directed. Ginger has been used for thousands of years to relieve nausea, indigestion and stomach upset, and may also relieve sore throats or headaches due to colds. 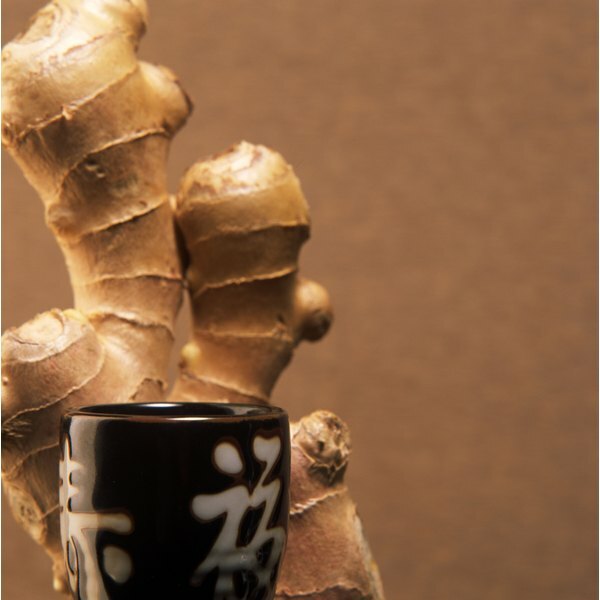 Ginger tea may comfort a baby suffering from mild indigestion or colic, but should not replace medical advice. Buy ginger tea loose or in tea bags and steep it for two to four minutes to make a mild, diluted tea for baby. Add more water if necessary to cool it and dilute it. Feed baby up to 4 oz. ginger tea served at lukewarm temperature. Peppermint or fennel teas are also good teas to soothe and calm a fussy baby, according to Dr. Lisa Watson, ND. Although herbal teas have a very safe track record, herbs should be used with caution. Some sources, such as the University of Maryland Medical Center, caution against giving ginger to children under the age of 2. Consult your physician before giving your baby ginger tea and watch for symptoms of more serious illness, such as fever, vomiting or severe pain. If your baby is old enough to eat crackers and cookies, offer ginger snaps to quell stomach upset or nausea. "Gripe water" is a natural, safe product for infants that contains fennel, ginger and bicarbonate of soda. Try it to relieve colic or upset stomach, according to Dr. Jerry Rubin, MD, author of "Naturally Healthy Kids." AskDrSears.com: What's Colilc? Does Your Baby Have Colic?